When time comes to configure the "tool dia." for a tapered end mill aka V-shaped engraving bit, it is rather difficult to calculate the width of the groove regarding the milling depth, especially when the tip is flat. I made a spreadsheet for computing the values. Unfortunately, it is not possible to embed this spreadsheet into this page. Only the first page is presented (Fig. A1). It provides the mill geometry with its dimensions. The following tables (fig. A2) have been computed with this tool and provided, ready for use. Fig. A1 : Calculator User Interface Overview. The groove width is found at the intersection of the 2nd column and the line corresponding to the angle. It corresponds to the figure that shall be entered in the "Tool dia." boxes. This example is dedicated to the isolation routing. We'll use a 35 µm thick copper clad substrate. A 50 µm cutting depth has been chosen to provide a small margin. The machining will be performed in several passes. 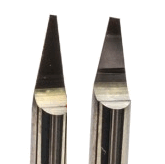 The available taper end mill has a 60° tip with a 0.1mm flat. The corresponding groove has a 0.158 mm width. Concerning the isolation, the walls are not parallel since the bit is tapered, hence the dimension shall be taken at the bottom of the copper layer. The greater the angle, the larger the reduction of the isolation. Here, it will be reduced by 4.04/100 mm on both sides of the gap. This reduction is not reported in the tables below.